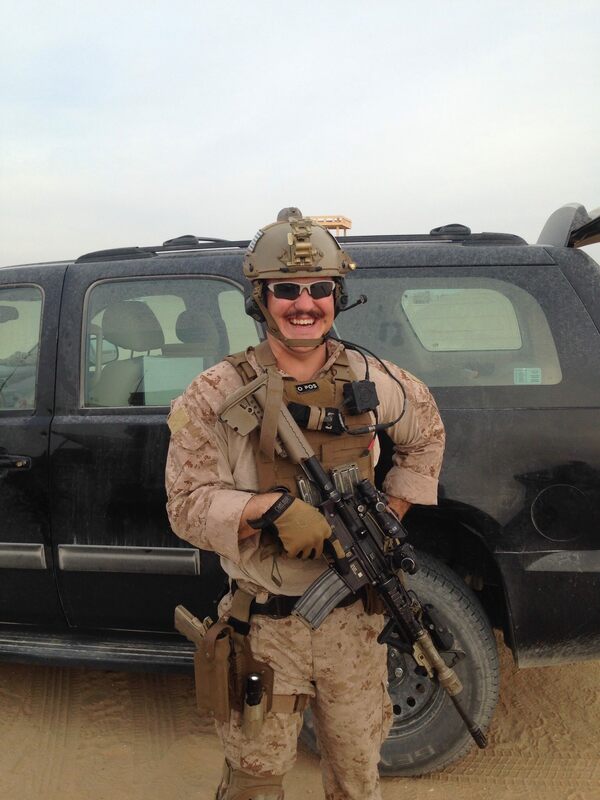 (Combat Injured) MSgt Special Agent Adam M. Boccher is assigned to AFOSI Detachment 327, Little Rock AFB, AR. 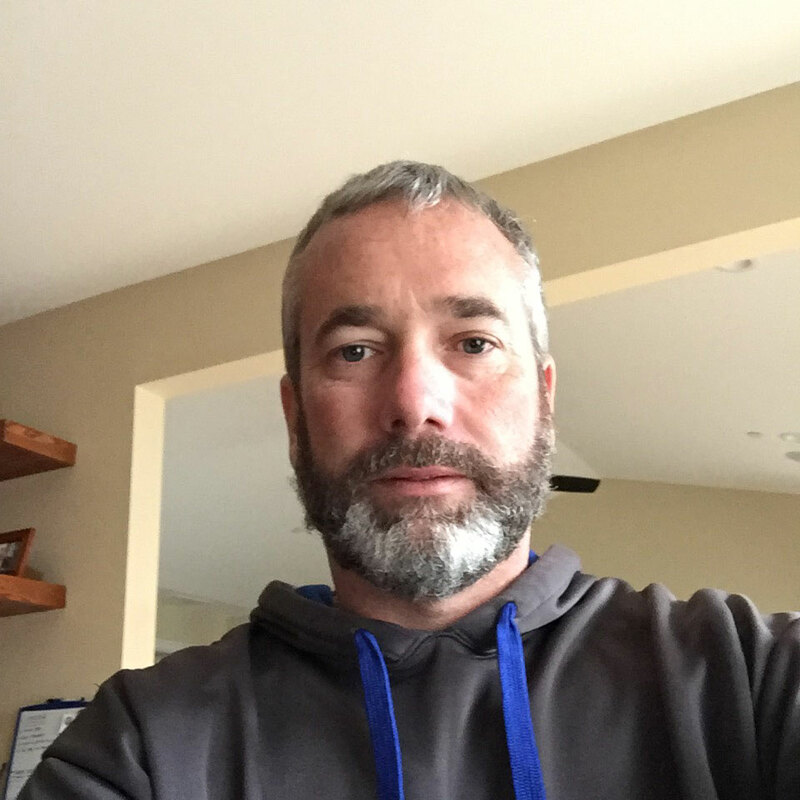 Agent Boccher joined the USAF in July of 1999, and spent his first four years as a Major Traffic Accident Investigator and Criminal Investigator with the 97th Security Forces Squadron, Altus AFB, OK. Agent Boccher retrained into AFOSI in May 2004 and has since conducted high-interest felony criminal, fraud, and counterintelligence investigations, and participated in high profile Protective Service Operations to include the Secretary of the Air Force and Chief of Staff of the Air Force. In September 2011, Agent Boccher lateral transferred into AFOSI's polygraph program were his primary duties included conducting criminal, counterintelligence, and security screening polygraph examinations. 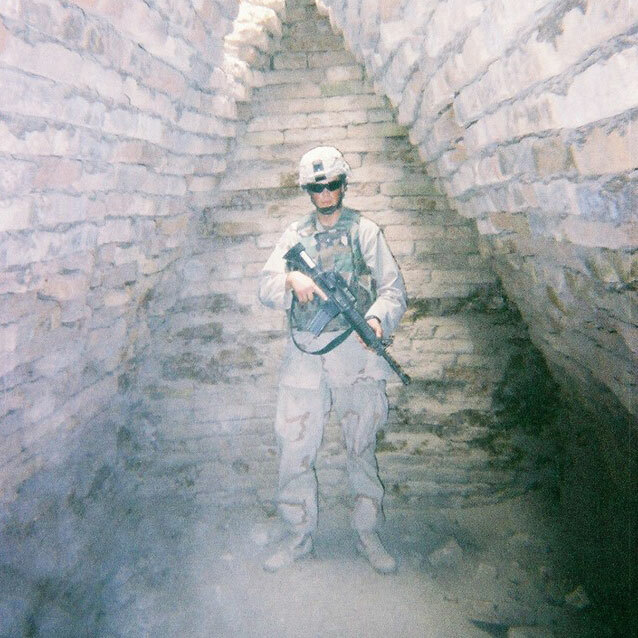 (Purple Heart Recipient) John joined the Army in July of 2008 as a Combat Engineer (12b). After training in Ft. Leonard Wood, MO, he was stationed at Ft. Hood, TX. He was assigned to the 36th EN BDE 20th EN BN 584th CO. It was during this assignment that John became best friends with SPC. Donald “Scott” Morrison. John was deployed two times to Afghanistan. 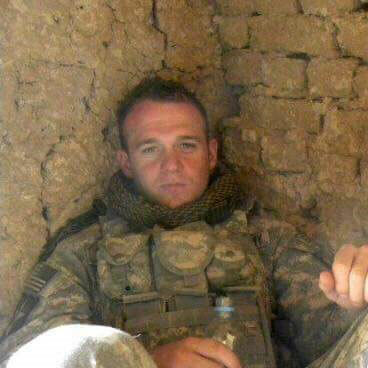 During the first deployment in 2010, his friend, SPC Morrison, was KIA in Arghadab Valley (south/eastern Afghanistan). His second deployment was in 2012 to western Afghanistan. John was involved in several IED blasts. 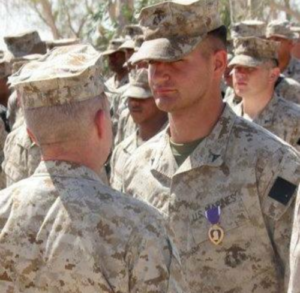 He received the Purple Heart for injuries sustained in one of those blasts. 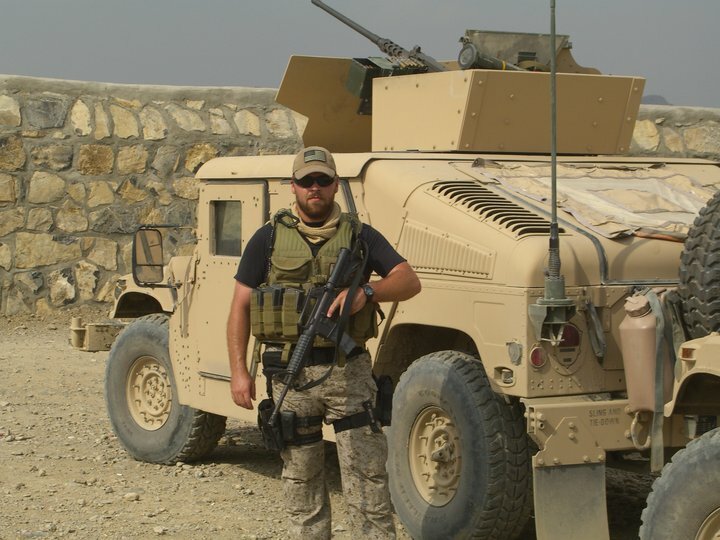 After returning from his second deployment, John was selected for Special Forces Training. He was stationed at Ft. Bragg, NC after completing Airborne School. 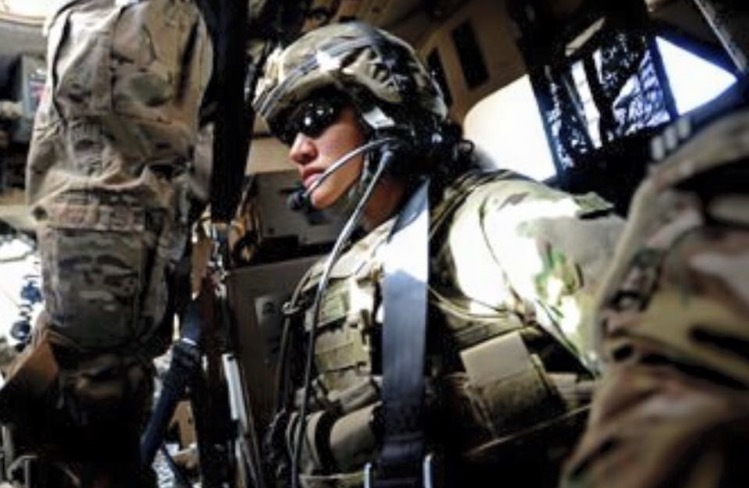 It was during a combat jump that John broke his hip that caused nerve damage in his lower back and his right leg. This injury caused his medical retirement from the Army. 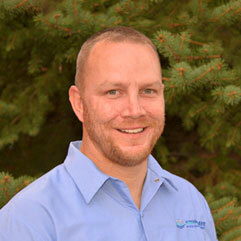 John now lives in Celina, TX with his wife Amanda and his two children, Hannah and Mason. 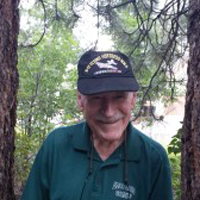 (Purple Heart Recipient) Alvis served in 2/327INF, 2/27INF, 2/5CAV, 196th QM, 129th CSSB. Two roadside IED's struck up an armored Humvee while on a routine mounted patrol striking him on top of his head. He had a fractured skull, swelling on his brain, and shrapnel covering his face, neck, head, and arms. He still has lingering effects over 13 years later. Military decorations include PH, MSM, ARCOM, AAM, GCM, NDSM, KCM, ACM, GWTEM, GWTSM, MOVSM, NCOPD, ASR. OSR, NATO(Kosovo) NATO (Afg ISAF)CIB, EIB, Air Assault Badge, and Expert Marksmanship Badge. 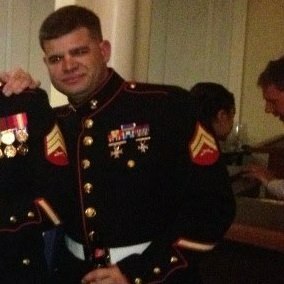 (Purple Heart Recipient) I joined the Marine Corps in 2003, directly out of High school. After Boot camp and Infantry training, I was assigned to 3/8 Lima company in Camp Lejeune in North Carolina. My Unit was put on alert not long after I arrived. March of 2004, we deployed to Haiti for security purposes. I was wounded only two weeks into the deployment. My squad was conducting presence patrols at night, and we were ambushed by enemy forces. The bullet damage to my arm was severe enough to require a life flight out, but that worked out great for me since I got to keep my arm. It took six months to get myself back to working order, which was perfect timing for the Fallujah Iraq deployment in 2005. Our unit came in on the backside of the main push of Fallujah, but it was no less dangerous. 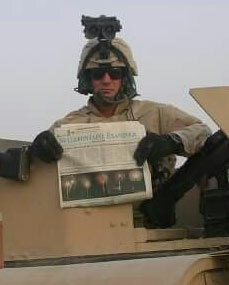 Our next deployment was to Ramadi Iraq in 2006, which was probably the hardest one. Our Unit took quite a few losses, but we made a huge impact in the area. I went home at the end of my contract in 2007 and began my civilian life deployment, which at times is far more difficult than the Corps. I now have a B.S in Exercise Science, with a minor in Psychology, and I'm working towards getting my Masters in Clinical Psych. I ultimately would enjoy helping Veterans with the road to recovery, both mentally and physically. 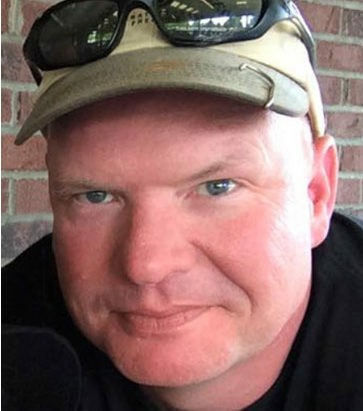 (Purple Heart Recipient) Ssg Rickey E Jones, joined Kentucky National guard April 1981, his mother had to sign for him to join, as he was 17 years old. He was a 36K Radio/Antenna Teletype operator, did this for approximately 8 years, he went to Desert Storm Aug 1991 thru May 1992, he was with the 438 M.P. Co, replacing the 338M.P. Co out of Louisville, Ky he was 35B- M.P./Customs Inspector. He served 2 years with Ky-JSO-Drug Eradication May 1992 thru September 1993, transferred to Trucking Company 2123rd Transportation Jan 1993, 88M-Heavy Equipment Transporter. He spent 10 years with them and drove all over America, 2002 he was activated for active duty with a trucking company out of Paducah, spent 12 weeks at Ft Campbell, then sent home, activated with 617th M.P. co. on October 6, 2004, he left for Iraq. On July 28th, 2005 he was hit by an IED while standing outside of his hummer, an Iraqi kid came up to him, saying "boom-boom", he went to investigate the "boom-boom" and it blew, he was sent to the ER in the green zone, all the bomb fragments that hit him where stopped by his vest, no broken bones, lots of bruises, he suffered a severe brain injury, which went undiagnosed for 3 years,he was awarded the Purple Heart and a Combat Action Badge, he came home October 31, 2005, which became the best day EVER! 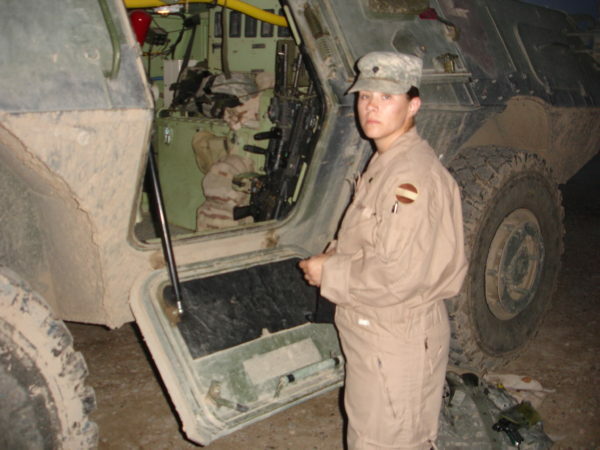 (Combat Injured) SGT Kelley K. Kellogg (E-5) survived a parachute malfunction at Fort Bragg in 2003, then deployed to Iraq from 2003-2004 with the 307TH EN BN of the 82ND Airborne Division. He took a round to his helmet when his convoy was attacked while heading back from Al Taqaddim to Ar Ramadi. Three of the four convoy vehicles were disabled by enemy actions and all 12 made it back in one HMMWV. There were multiple other events which resulted in bad times but that's the way it goes. Then, he deployed to New Orleans for Hurricane Katrina to secure the airport followed with search and rescue operations. Shortly after that he traveled to Lafayette, LA to do more search and rescue for Hurricane Rita. 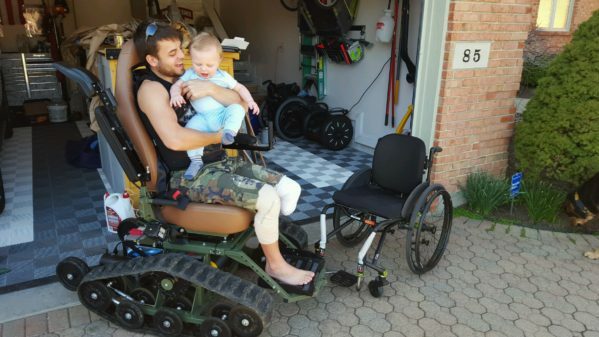 He suffers from severe PTSD and multiple TBI's. 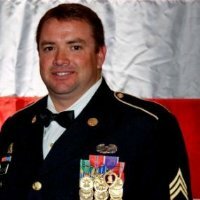 (Purple Heart Recipient) SSG Kolmerten joined the army in 2007 and upon graduating boot camp attended Explosive Ordnance Disposal training. After Graduation, Hal was sent to his first duty station, Mannheim, Germany. After two years he deployed to Afghanistan for the first time. Hal spent a year traveling around and working as part of an EOD Team responsible for disarming or destroying over 200 IEDs. Upon return from this deployment, he was transferred to Fort Stewart, GA where he became a platoon sergeant and was tasked with preparing 5 EOD teams for a Special Operations Support Mission, deploying in June of 2013. On his final mission in December 2013, Hal was shot by small arms fire in the left leg. He was medevac’d to Kandahar and then on to Germany. He returned to duty and was made eligible for assignment back to train the next generation of EOD Technicians. 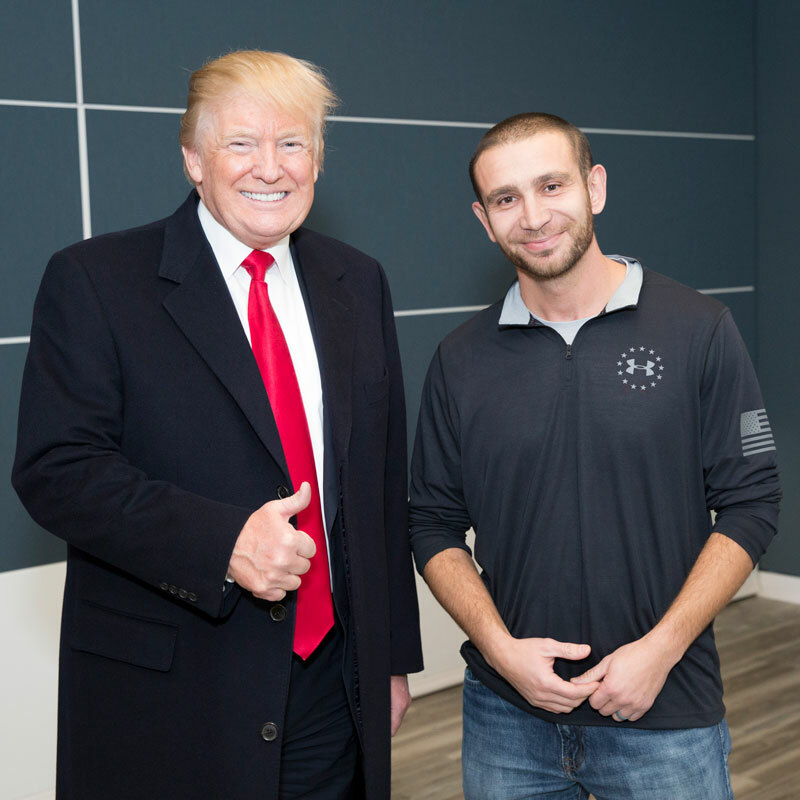 (Purple Heart Recipient) US Army MSG Pavel "Pasha" Palanker enlisted in the Army in May 2003 he is still on (Active Duty). 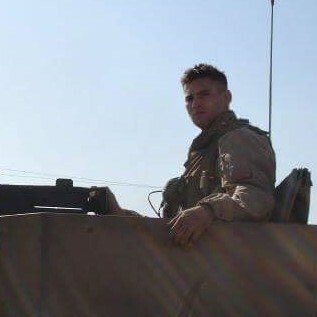 He Served multiple deployments to Iraq and Africa. Notable Awards include Purple Heart 7 Sept 2005 (Iraq), Purple Heart 3 Oct 2015 (Iraq), Army Commendation Medal with "V" device for Valor. 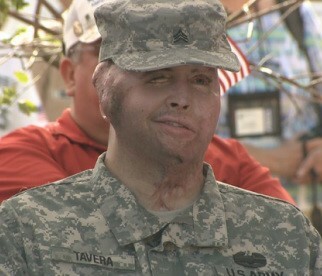 His injuries are a result of multiple IED explosions. Pasha lives with multiple TBIs, burns, permanent loss of hearing in his left ear, and severe PTSD. 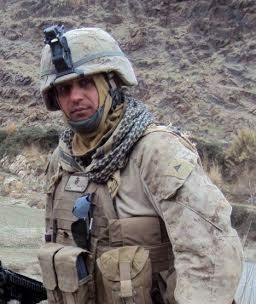 (Purple Heart Recipient) While deployed to Afghanistan, on Oct 1, 2009, IED explosion injury, including Penetrating Traumatic Brain Injury (TBI), right eye blindness; paralysis left side of body; vocal cords damaged, burns. (Combat Injured) Sgt Myles Smith, is 30 years old with a loving, supporting wife, and 2 beautiful children with one on the way. He served two combat tours in Iraq. His first deployment his convoy was hit by an IED. His vehicle rolled and the fire extinguisher busted him in the mouth and shrapnel went right below his gut. He suffered a traumatic brain injury. Jennifer began tripping and falling while running. 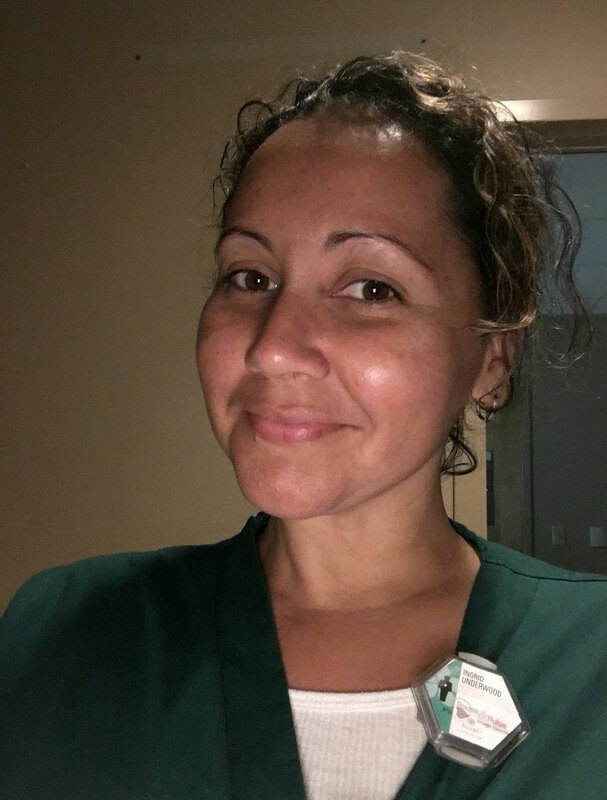 She was diagnosed shortly after with multiple sclerosis and was medically retired from active duty. Her condition has worsened over time and she is currently 100% service connected and unemployable. She receives treatment and all medical care through the Dayton VAMC. 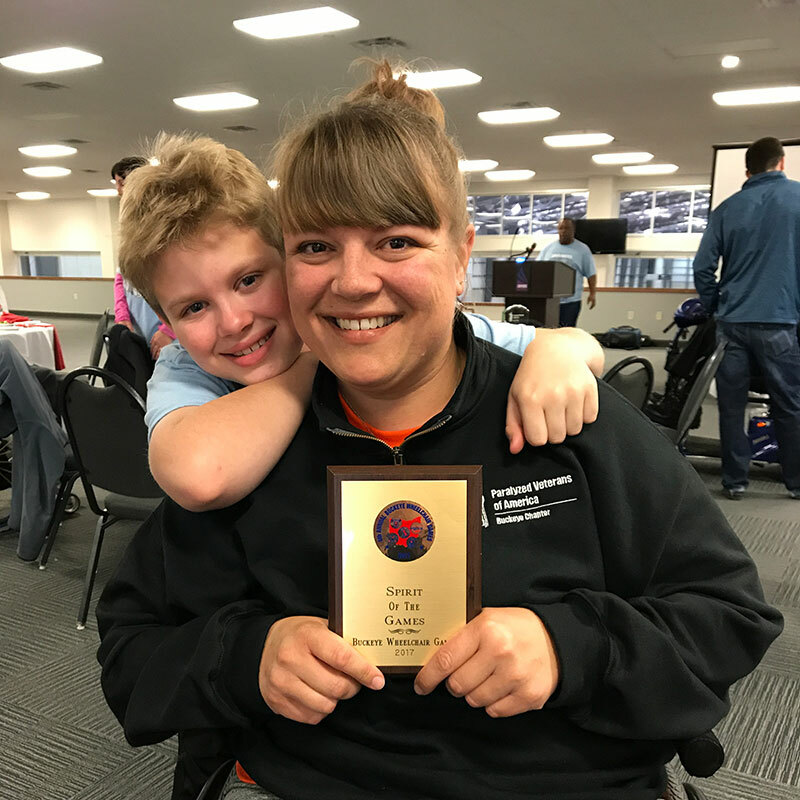 Her husband Ray and son Ethan have supported her through every obstacle and she wouldn’t have been able to make it as far as she has without them. 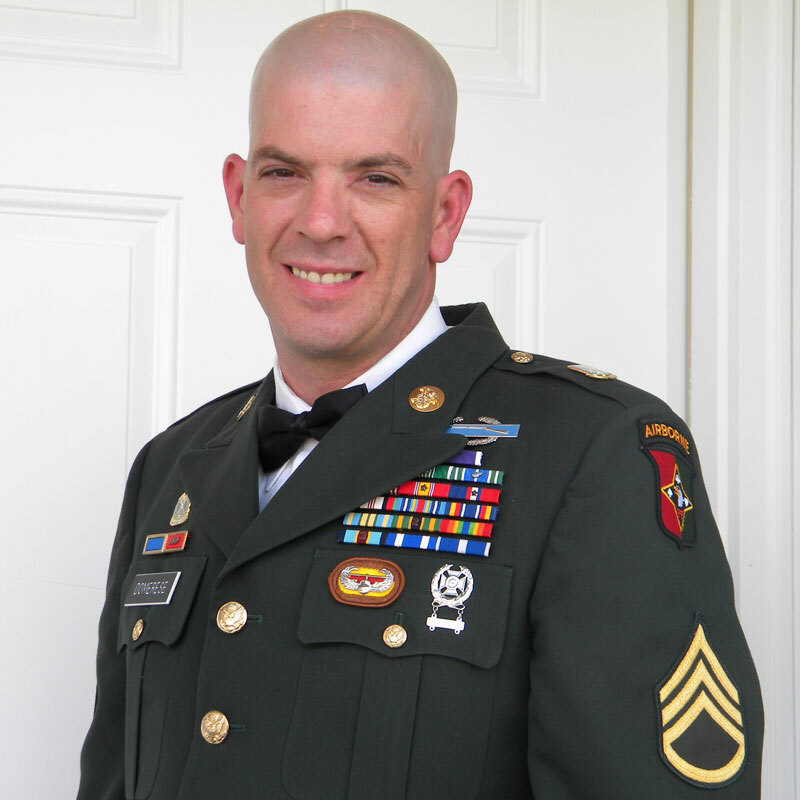 (Purple Heart Recipient) Stephen K Valyou enlisted in the Army a couple months after 9/11 occurred. He completed basic training in Ft Leonardwood, MO OSUT COMBAT ENG. He was stationed Ft Drum NY deployed with 10th Mtn Div to Afghanistan in 2003 attached to 1/87 INF 10th Mtn Div. 2004, volunteered for EOD field union graduation stationed again at Ft Drum, NY to the 725th EOD co. WLC, ATF Post Blast school, EOD refresher course, TL certification prior to deployment to Iraq . 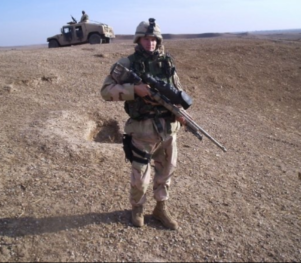 His deployment to Diyala Province Iraq December 2006, operated out of FOB Normandy Diyala Province under Navy MU2 supporting 6/9 Cav 1st Cav, as an operational EOD TL, conducting daily EOD operations to include IED and UXO RSP and disposals, route clearance, and other operational support. 29 March 2007 received a GSW to the upper right chest cavity, bullet traveled through both lungs and thoracic spine, leaving me paralyzed I am a T9 paraplegic in a wheelchair. 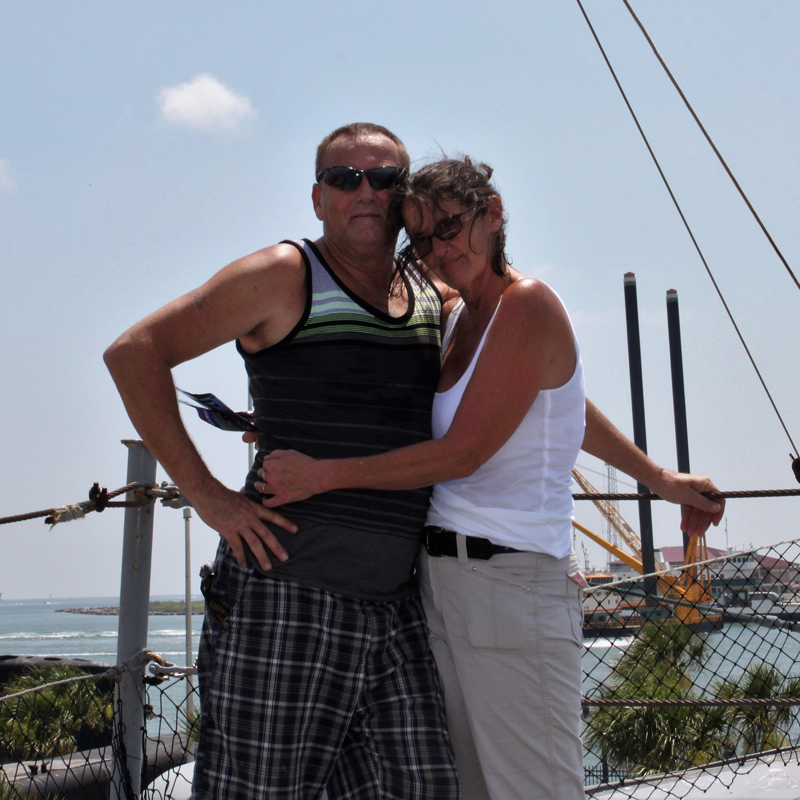 (Purple Heart Recipient) My last ride leaving Vietnam we hitched a ride with a helicopter that just came out of maintenance to take us to a base where we would be sent stateside at the end of our tour. Back then, you had to arrange for your own transportation. There was a pilot, co-pilot, myself and another pilot. We began to take fire (we were unarmed). It was like a pop corn popper in the helicopter. The pilot was shot in the leg, as he dropped the controls, the co-pilot recovered the aircraft. As soon as he put his hands on the controls, he was shot and killed. The cabin was like a pop corn popper with rounds and shrapnel and was now covered in blood. When the co-pilot was shot, the pilot attempted to regain control of the aircraft and was again shot in the hand. I used my belt as a tourniquet for the wounded pilot and we pulled the co-pilot out of the seat so that the other pilot with me could gain control of the aircraft while I administered first aid. We landed and I did not realize I had been shot until the other pilot pointed it out. 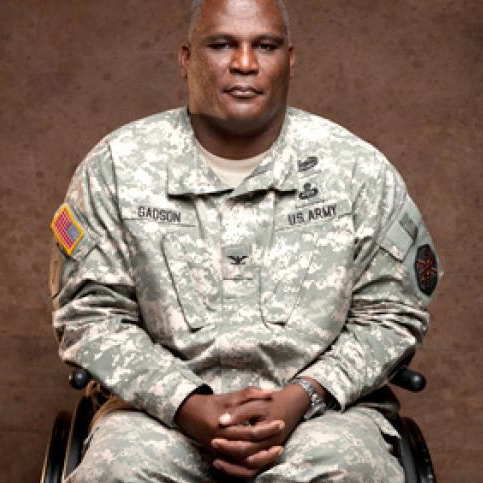 (Purple Heart Recipient) Gregory D. Gadson (born February 19, 1966) is a retired colonel in the United States Army and the former garrison commander of the U.S. Army Fort Belvoir. 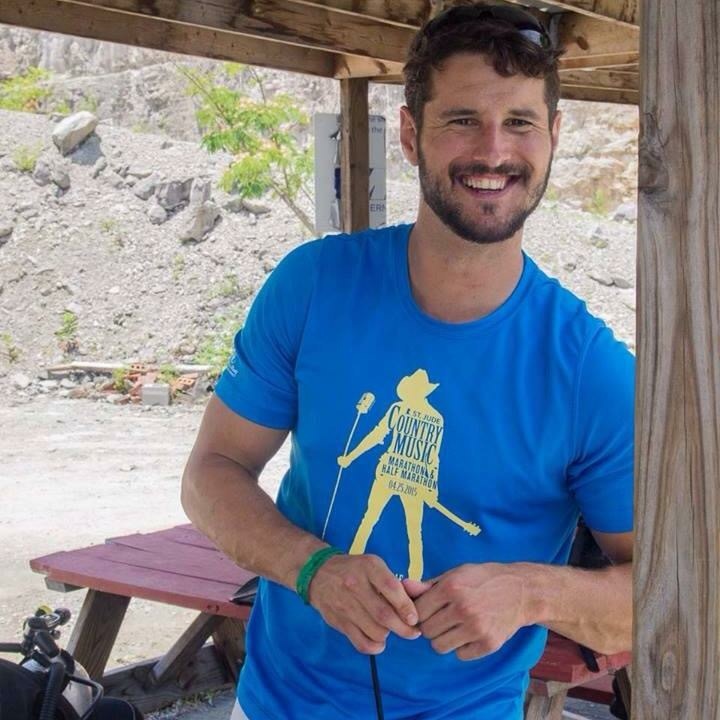 He is also a bilateral above-the-knee amputee, occasional actor, and motivational speaker. 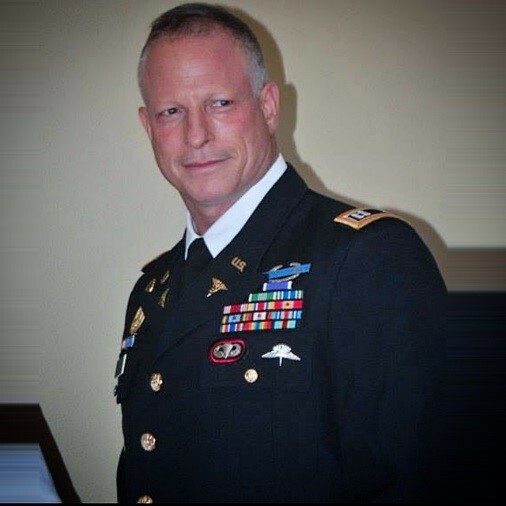 He served in the U.S. Army for more than 20 years as a field artillery officer and served on active duty for Operations Desert Shield and Desert Storm, Operation Joint Forge, Operation Enduring Freedom, and Operation Iraqi Freedom. Gadson attended the United States Military Academy at West Point, New York, graduating in 1989. He also holds a master's degree in information systems from Webster University and a master's degree in policy management from Georgetown University. He is a graduate of the Command and General Staff College and the Advanced Field Artillery Officers Course and in 2010, he became an Army War College Fellow at the Institute of World Politics in Washington, D.C.
2nd Battalion, 32nd Field Artillery. 4th Infantry Brigade Combat Team, 1st Infantry Division (Fort Riley). Battalion fire direction officer for 5th Battalion, 18th Field Artillery, III Corps at Fort Sill. Division targeting officer, Headquarters and Headquarters Battery, 82nd Airborne Division Artillery. Battalion adjutant, 3rd Battalion, 319th Airborne Field Artillery Regiment. 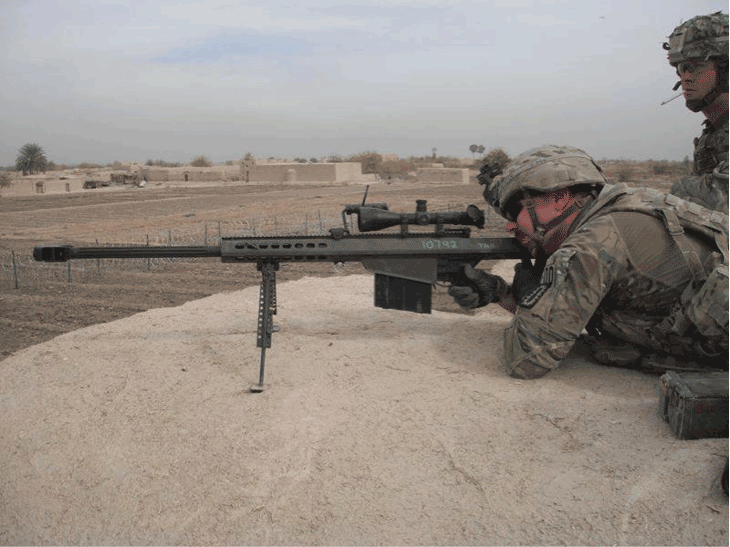 Battalion fire support officer, 1st Battalion, 504th Parachute Infantry Regiment. 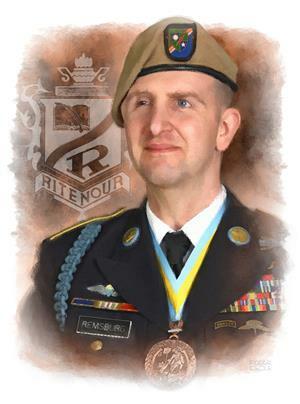 Commander, Battery C, 3rd Battalion, 319th Airborne Field Artillery Regiment. Commander, Headquarters and Headquarters Company, 82nd Airborne Division for the 82nd Airborne Division at Fort Bragg. Personnel distribution officer and human resources commander, Alexandria, Virginia. 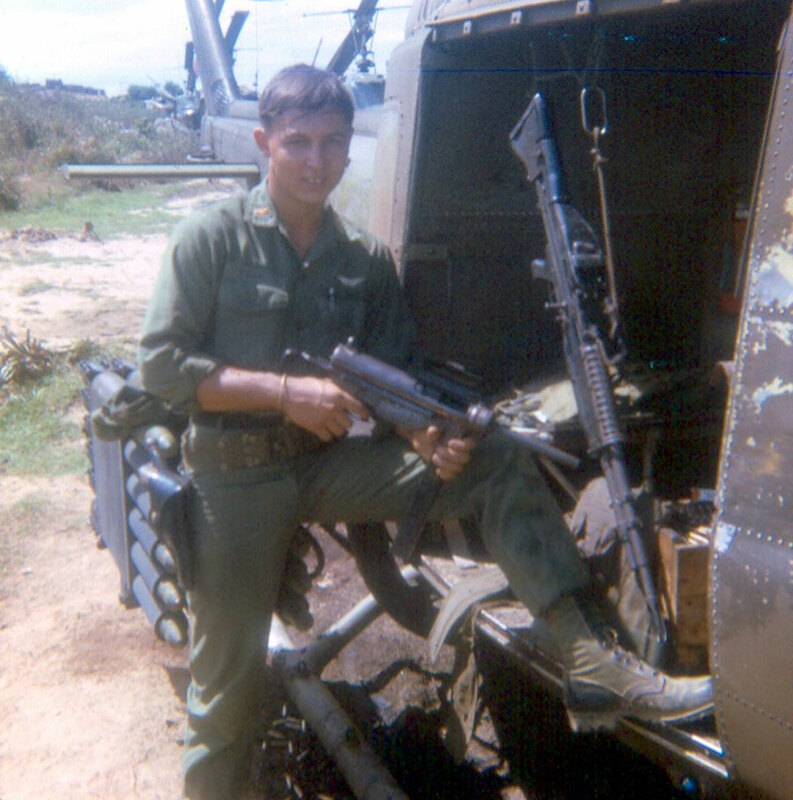 Battalion operations officer, 2nd Battalion, 11th Field Artillery. Operations officer, 25th Infantry Division, executive officer. Special assistant to the commanding general, United States Army Pacific at Fort Shafter. On the night of May 7, 2007, while returning from a memorial service for two soldiers from his brigade, he lost both his legs and severely injured his right arm to a roadside bomb in Baghdad. He became one of the first military personnel to use a next-generation powered prosthetic knee with technology to make it possible for amputees to walk with confidence and with a more natural gait. “My name is William Lamar Grafton but everyone calls me Bill.” This is the first sentence in Bill’s autobiography titled: “Before and After General Patton”, copyright February 28, 2008. He is an amazing man who loves America, baseball and apple pie! Bill was born at home in Meridian, Mississippi on November 11, 1924. He was the 5th of 6 boys. Since Bill was born on Armistice Day (Veteran’s Day), one of Bill’s brothers tried to convince his parents in naming him “Armistice”. Bill is glad his parents did not listen to his brother and named him William, instead. Bill remembers growing up on a 16 acre farm where life was carefree and full of adventure. Life was good on the farm for Bill and his family. He does not ever remember an evening meal where they did not have company. It seemed like the other farm boys were always at their home. When the Great Depression hit in 1929, Bill and his family had plenty to eat since they raised their own cows, pigs, chickens, and turkeys. They also had a large garden, pecan trees and an orchard. He said they fed not only their family but also their friends and neighbors at this time as well. When Pearl Harbor was bombed on December 7, 1941 and war was declared by our President, Bill’s brothers began to sign up to serve in the Army Air Corp. Bill had to wait a year before he could sign up because he was not old enough to follow four of his brothers into the war right away. He had a hard time convincing his mother to let him be the fifth of her sons to sign up for the military but she finally agreed. Fortunately, all five boys survived the war of all wars and came back home to her and their wives. Bill trained to be a gunner in B-17 bombers. They were dropping bombs over Hungary when they were attacked by German fighters. His plane was hit, Bill parachuted out with the others and landed in Hungary where he and another fellow airman were turned over to the German police. He spent time in a Hungarian prison and then was moved to a German concentration camp in Sagan, Germany. In January 1945, the Russians were getting close to their camp so the Germans began to march them out of the camp to another location. Bill remembers making a backpack out of a wool GI shirt with a needle and thread. He said he put all his clothing on his body, found some woolen socks somehow and began to march in a foot of snow and howling wind in what was suspected to be 40 below weather. They marched all that night and would stop for only minutes at a time when Bill would eat some Red Cross issued chocolate that he kept close to his body so it wouldn’t freeze and break his teeth. A number of men froze to death. He believes that the chocolate and the wool socks kept him able to march and kept him alive! Bill was moved from camp to camp as the Americans or Russians would get closer and closer to their German occupied camps. On April 29, 1945, General Patton liberated Bill’s final camp. Bill was able to go home and start living again in freedom! (Purple Heart Recipient) Captain, USAF: POW in North Vietnam, December, 1967 to March, 1973: 5 years, 3 months. The rescue of Guy and Captain Charles Neel, who Guy characterizes as a fighter pilot's fighter pilot, is a truly awe inspiring story of the dedication and courage of the Jolly Green Chinook Helicopter Search and Rescue units. His second shoot down on December 20, 1967, resulted in a five year, three month odyssey that humbled his pride, tested his fortitude, and forged his faith. In the courageous Christmas bombing of late 1972, Strategic Air Command US Air Force B-52 Bombers and Tactical Air Command Fighters and US Navy Aircraft Carrier Fighters forced the North Vietnamese to release Guy and the other surviving POWs in March of 1973. 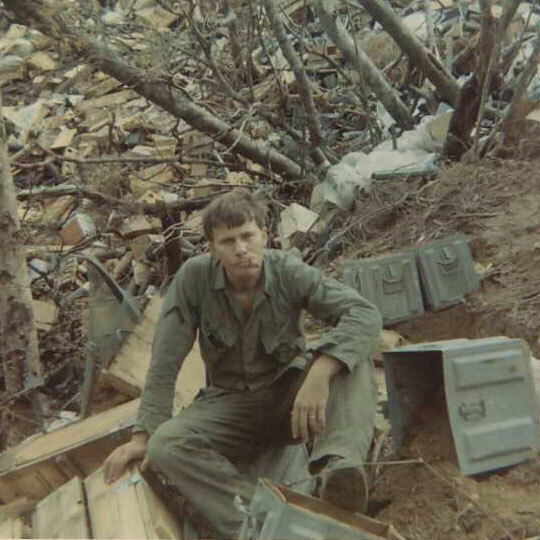 Guy's brother, Terry, volunteered for multiple tours in Vietnam over the years of Guy's imprisonment in his attempt to best help to end the war and bring Guy home. Terry was shot down two times and crash-landed once behind enemy lines during those tours. His persistence was rewarded and he flew one of the B-52s which actually did bomb his brother out of prison camp. Of the more than 3500 aircrew members who were shot down and not rescued in North Vietnam, 457 survived. The North Vietnamese and the Russians had tortured to death or killed in one way or another six out of seven aircrew members. There were a total of five hundred and ninety-one surviving POWs of all military services released in 1973 for return to the States during "Operation Homecoming." PERSONAL DATA: Born April 28, 1956 in Amarillo, Texas, to Mr. and Mrs. Charles W. Lockhart. Married to the former Mary Theresa Germaine of Boston, Massachusetts. An avid outdoorsman, he enjoys hunting, fishing, and sports such as kayaking. EDUCATION: Graduated from Tascosa High School, Amarillo, Texas, in 1974; received a bachelor of arts degree in mathematics from Texas Tech University in 1978, and a master of science degree in aerospace engineering from the University of Texas in 1981. Studied at the University of Innsbruck and the University of Vienna Summer School from 1978-79 on a Rotarian Fellowship. Has also completed aerospace related courses from Syracuse University and the University of Florida and is a recent graduate of the Royal College of Defence Studies, London, England. ORGANIZATIONS: Society of Experimental Test Pilots, Order of Daedalians (Fraternal Order of Military Pilots). AWARDS: Recipient of the Defense Superior Service Medal, Defense Meritorious Service Medal, Air Force Aerial Achievement Medal, Commendation Medal, Outstanding Unit Award with Valor, National Defense Service Medal, Achievement Medal, and numerous other service recognitions and ribbons. He is also a distinguished graduate of both ROTC and the Air Force Squadron Officer School. 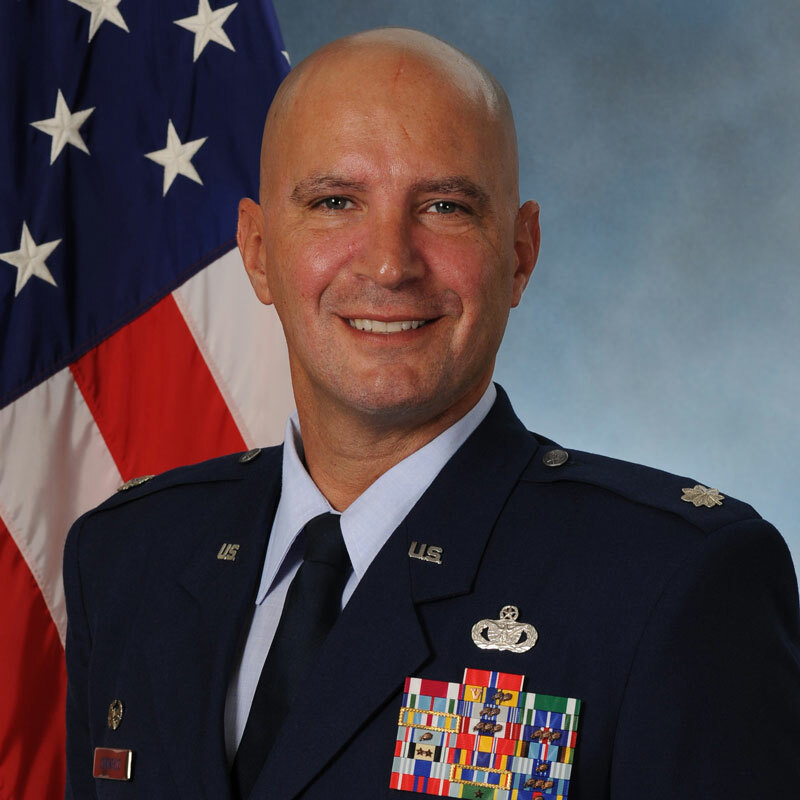 EXPERIENCE: Lockhart was commissioned a 2nd Lieutenant in the USAF in 1981. Upon graduation from pilot training in 1983, he was assigned to the 49th Fighter Interceptor Squadron flying T-33s. In 1986, he transitioned to the F-4 and flew operationally with U.S. Air Forces, Europe (in Germany) from 1987-1990 as an instructor pilot for F-4 and F-16 aircrew in the tactics of surface-to-air missile suppression. In 1991 he reported to Edwards Air Force Base for year long training as a test pilot in high performance military aircraft. Upon graduation, he was assigned to the Test Wing at the Air Force Developmental Test Center at Eglin Air Force Base, Florida, performing weapons testing for the F-16 aircraft. During his 4-1/2 year tour at Eglin, he was selected as the Operations Officer for the 39th Flight Test Squadron. Much of America’s state-of-the-art weaponry was first tested under his guidance at the 39th Flight Test Squadron. 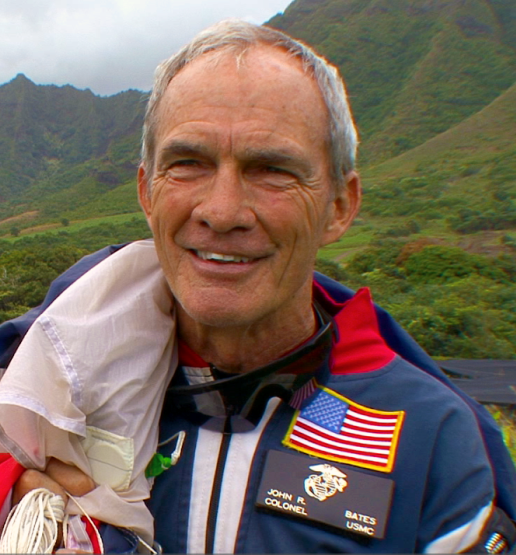 He has logged over 5,000 hours in more than 30 different aircraft and the Space Shuttle. NASA EXPERIENCE: Selected by NASA in April 1996, Lockhart reported to the Johnson Space Center in August 1996. 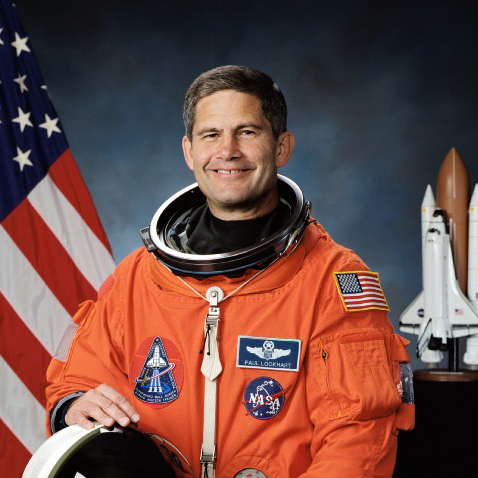 After completion of initial astronaut training, Lockhart was assigned to the Astronaut Office Spacecraft Systems/Operations Branch where he worked various technical issues including the Space Shuttle Main Engine (SSME) and redesign of the orbiter’s flight display. A veteran of two space flights, STS-111 (June 2002) and STS-113 (November 2002), Lockhart has logged 26 days, 39 minutes, and 82 seconds in space. Lockhart left NASA in January 2005 and returned to the Air Force. 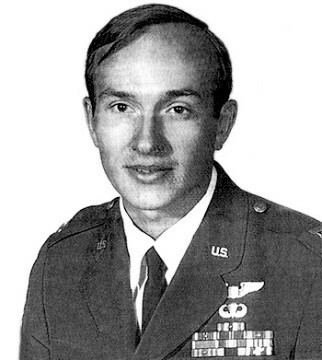 Post the Columbia accident, Col Lockhart attended the Royal College of Defence Studies (RCDS), London, England, as an exchange officer in fulfillment of Air War College. The Ministry of Defence’s premier institution for grooming senior leaders in the UK military and civil fields, Col Lockhart completed a year of Studies in International Conflict Resolution at RCDS with 84 other fellow members representing 44 nations from around the world. 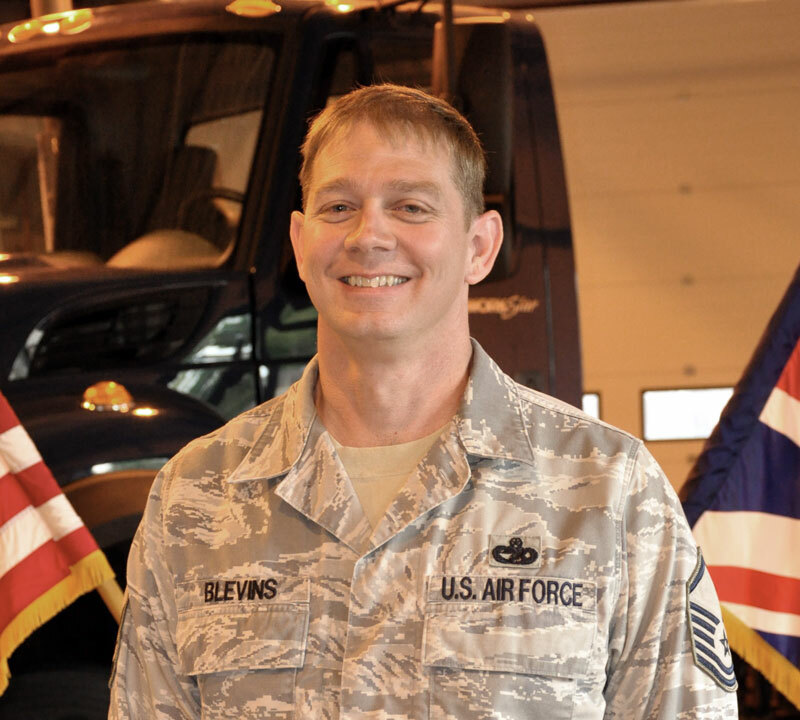 After graduation, he was assigned to the Air Staff, Headquarters USAF, Pentagon, where he has held the position of Director, Future Capabilities at the Air Forces Directorate of Studies and Analysis, Assessments, and Lessons Learned (HQAF/A9). Paul Lockhart retired from the Air Force in March 2007. From February 2007 through 2008 he served as Special Assistant, Program Management, Explorations Systems Mission Directorate, NASA Headquarters, Washington, D.C. and as Acting Division Director, Constellation Systems Division. Paul Lockhart now currently works in the private sector where he is the Senior Vice President for QinetiQ North America, a subsidiary of QinetiQ Inc., headquartered in London, England. SPACE FLIGHT EXPERIENCE: STS-111 Endeavour (June 5-19, 2002). The STS-111 mission delivered a new ISS resident crew and a Canadian-built mobile base for the orbiting outpost’s robotic arm. The crew also performed late-notice repair of the station’s robot arm by replacing one of the arm’s joints. It was the second Space Shuttle mission dedicated to delivering research equipment to the space platform. STS-111 also brought home the Expedition-Four crew from their 6-1/2 month stay aboard the station. Mission duration was 13 days, 20 hours and 35 minutes. Unacceptable weather conditions in Florida necessitated a landing at Edwards Air Force Base, California. STS-113 Endeavour (November 23-December 7, 2002) was the sixteenth Shuttle mission to visit the International Space Station. Mission accomplishments included the delivery of the Expedition-Six crew, the delivery, installation and activation of the P1 Truss, and the transfer of cargo from Shuttle to the Station. During the mission Lockhart coordinated spacewalk activities. STS-113 brought home the Expedition-Five crew from their 6-month stay aboard the Station. Mission duration 330 hours and 47 minutes. The Royal Irish Regiment- Iraq, Afghanistan, Sierra Leone, Kosovo and Northern Ireland Veteran. A British Army veteran of 24 years’ service Michael has deployed in support of the global war on terror with 4 tours of Iraq and 3 to Afghanistan. Tours of Kosovo, Sierra Leone and 6 years’ service on Counter Terrorist Operation in Northern Ireland where also conducted during his career. 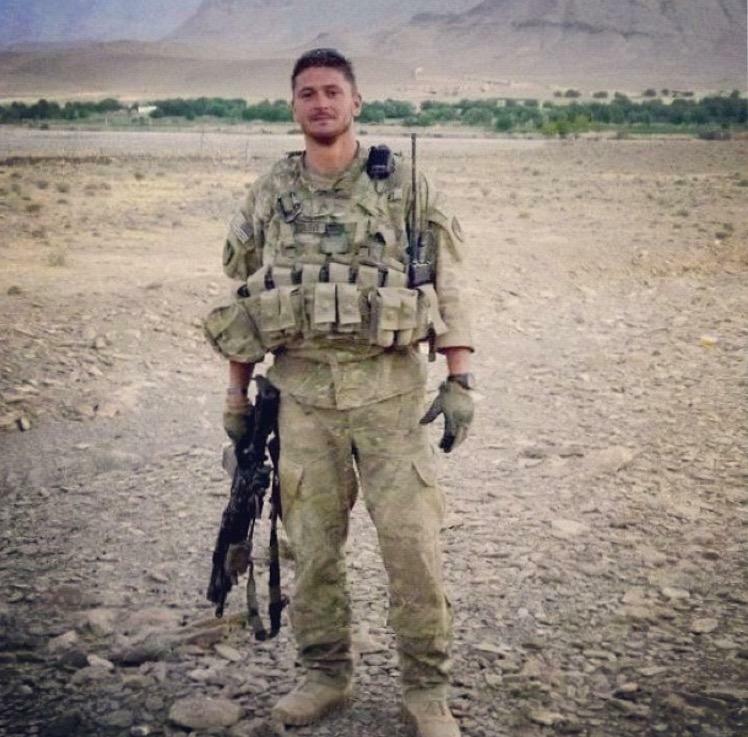 It was in Afghanistan in 2008 whilst serving alongside the Afgan National Army (ANA) as part of the Operational Mentoring and Liaison Team Battle Group (OMLT) that Michael was injured in a Suicide Vehicle Bourne Improvised Explosive Device (SVBIED). Warrant Officer Class 1 (Regimental Sergeant Major, RSM) Logan’s career has spanned over 24 years of military service, within which he has fulfilled a variety of roles. His principle responsibility throughout the majority of his career has been the command, leadership and management of Infantry soldiers. This responsibly has ranged from sections of 8 soldiers up to a Battalion of 500 men and woman. Outside of his core role Michael has specialised in a number of other key areas including, logistics, equipment care and management, administration and Operational planning and training. Michael’s ability was recognised throughout his career by regular promotions in rank. This dynamic journey culminated with his promotion to Regimental Sergeant Major of a regular Army Infantry Battalion. WO1 RSM is the senior rank a soldier can reach and appointment of RSM is only achieved by the most capable soldiers in the British Army. 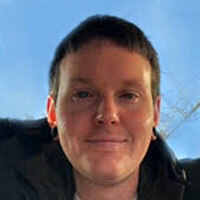 Having left the military in 2011 Michael has worked very closely with veterans, he plays an active role within 3 main charities, Deptherapy (Using scuba diving to help physically and mentally challenged veterans. Beyond The Battlefield & Out of the Shadows, two Northern Ireland based charities supporting veterans and families who have been affected during the troubles in Northern Ireland. 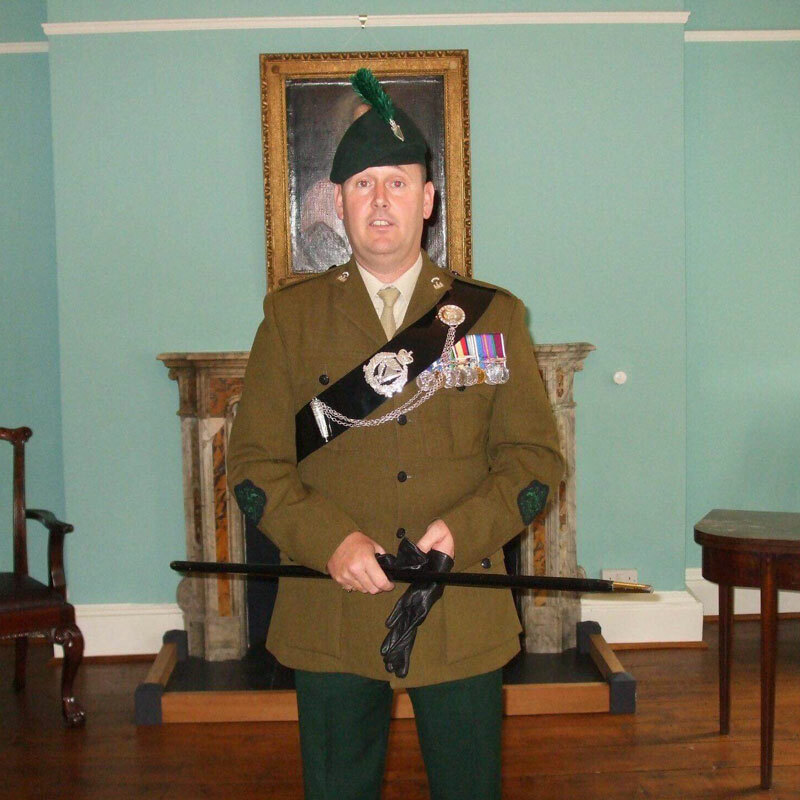 Born in Belfast, Northern Ireland Michael enlisted in The Royal Irish Rangers in 1987 a unit that in 1992 was to be amalgamated with the Ulster Defence Regiment (UDR) to form The Royal Irish Regiment. Michael has one daughter, Ellie 22 who has followed her dad into uniform and is currently servicing as Police Officer within Police Scotland. (Combat Veteran) Lt Col Lombardo is the Commander of the 341st Missile Security Forces Squadron, the “Gunslingers.” His team of 248 Security Forces Defenders provide the first line of defense and immediate response for the 150 ICBM Launch Facilities and the 15 Missile Alert Facilities in a 13,800 square mile area of responsibility, 24 hours a day, 365 days a year. 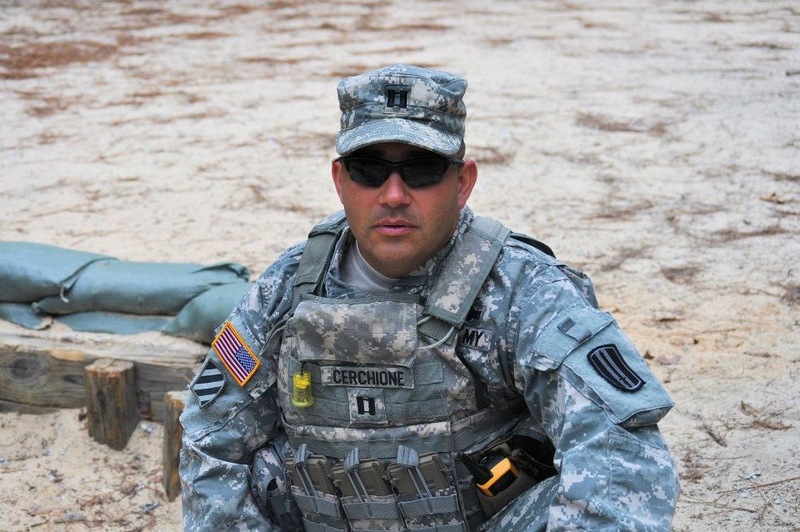 Lt Col Lombardo is a Combat Valor decorated Officer who is very active in Wounded Warrior programs. 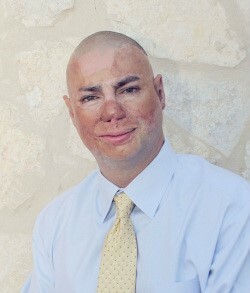 He is an in-demand speaker for PTSD and Combat Stress platforms. He entered the Air Force in 1996 as an enlisted Defender. In 2002, Lt Col Lombardo commissioned through the Air Force Reserve Officer Training Corps at Kent State University in Kent, Ohio. He has worked at numerous operational wings, MAJCOMs and Combatant Command positions. Lt Col Lombardo was inducted into the Ohio Military Hall of Fame in 2018. 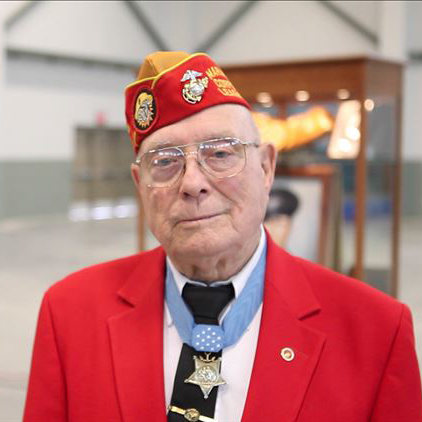 (Medal of Honor/Purple Heart Recipient) Hershel “Woody” Williams was born in 1923 and raised in West Virginia. After initially being rejected by the U.S. Marine Corps in 1943 for being too short, he was able to join the Marine Corps Reserve a few months later when the height requirement was reduced. On October 30, 1943, he joined the 32nd Replacement Battlion, which was sent to fight in the Pacific Theater of World War II. Williams fought in the Battle of Guadalcanal and in Guam before landing on Iwo Jima on February 21, 1945. Two days later, on the day the flag was raised on Iwo Jima’s Mt. Suribachi, Williams’ unit was bogged down in a heavily fortified area. Williams, with the aid of cover fire from only four Marines, used a flamethrower to attack enemy machine gun pillboxes. After destroying several Japanese positions, he opened a gap in the Japanese defenses which enabled the Marines to move ahead. 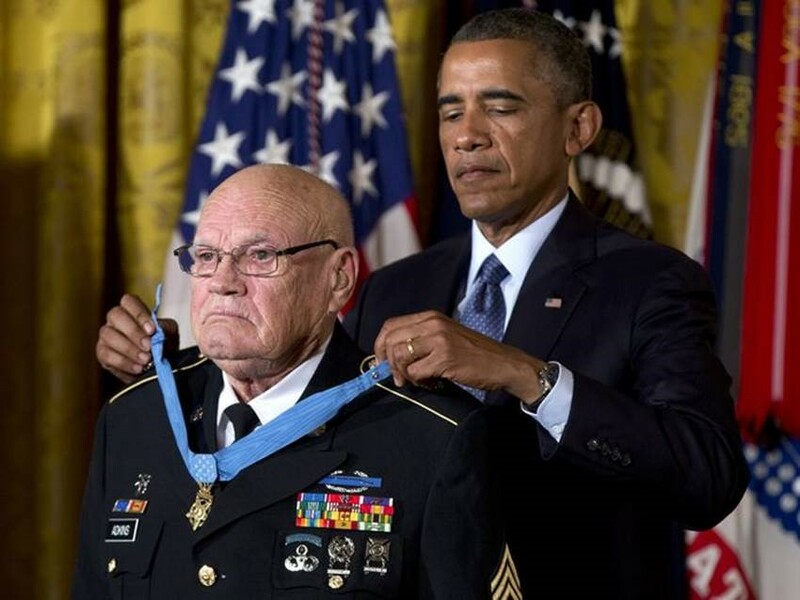 For his actions on February 23, Williams received the Medal of Honor on October 4, 1945, from President Truman. 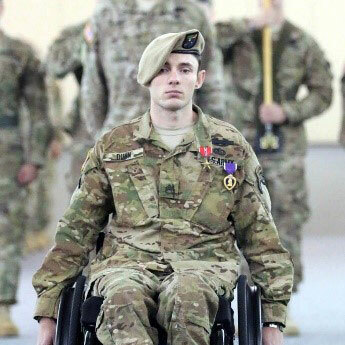 He was also awarded the Purple Heart after being wounded on March 6. Following the war, Williams served in the Marine Corps Reserve and retired as a chief warrant officer in 1969. He became lay minister for his church and served as Chaplain Emeritus of the Congressional Medal of Honor Society. He was also a Veteran Services Officer at the Veterans Administration for 33 years, until his retirement in 1978.